View our complete range of sliding door gear. Sliding door hardware is a hugely popular design choice within residential projects, giving homeowners seamless functionality, optimum storage capacity and a stylish finish. Häfele offer a fantastic variety of sliding door products, ranging from sliding door handles, sliding door tracks and interior doors products. We pride ourselves on supplying easy to install, affordable hardware that outperforms other interior sliding door solutions in the market - making sure you get the best price, without compromising on quality or style. What is Sliding Door Gear? Sliding door gear is hardware used on a door instead of hinges to allow it to be opened by sliding to the side. The most popular type of system is called a 'Top Hung' system, wherein a door is hung by two trolley hangers at the top, running in a concealed track. All the weight of the door is taken by these two hangers making the door easy to move. At each end is a track stopper, installed to both absorb any impact made if the door is slammed and also to hold the door in the open or closed position. On some systems the stopper can also be upgraded to a soft close mechanism similar to kitchen draw technology. Why use Sliding Door Gear? The predominant benefit for using sliding door gear is the amount of space saved when compared to standard hinged doors. As doors don’t open into a room outwards, they slide along or into a wall, you save an average of 1270mm of operating space per door, or up to 5 metres if 5 sliding doors are used per house. As well as being a desirable, modern product they are also a safer option in the home, preventing common injuries caused by swinging doors, and when large heavy doors are used sliding doors are much easier to move for the user. In the modern home, storage space is limited and choice is abundant. Sliding wardrobes are a popular option for bedroom designers due to their simplistic design and ability to blend into a deliberate bedroom design, without interrupting the style. 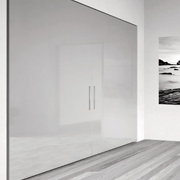 Häfele stock a fantastic range of sliding wardrobe products, offering not only a vast choice of easy to install solutions but a variety of price points to suit your budget. 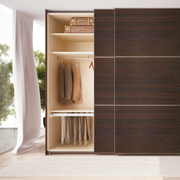 The PS10 is a premium quality, smooth running system for large wardrobes, and sliding cabinet doors. Although we sell parts separately for your convenience, you can also buy everything you need at once, making sure nothing is forgotten. We also include patented soft close units for every door, making sure the finished product works as hard as you do! The PS40 is a flush sliding wardrobe doors system, offering your customers a highly desirable and on trend design choice. Available to buy as a complete fitting set with the tracks, or in component parts, we offer flexibility alongside affordability. 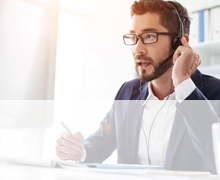 With soft close as standard, this system won’t let you down. Eku Frontino 40 – This premium wardrobe sliding system is exclusive to Häfele, offering superb functionality and style you can’t find elsewhere. 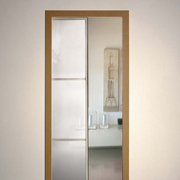 Suitable for all wardrobes or tall cabinets, this flush sliding system offers symmetry and balance, making it a beautiful feature in any residential property. The use of sliding door gear for interior doors is a highly desirable feature for many homeowners. Internal sliding doors divide space when required to, without the permanence and commitment of a wall, allowing designers the versatility of space that they often expect. Häfele understand that both durability and ease of installation are paramount to any project involving fitting sliding internal doors, with style and finish the coveted requirement of your customer. This is why we offer a varied selection of fantastic interior sliding door systems, so you know you can always visit us for your perfect solution. Evolve 80 is an automated sliding door system ideal for a modern home. The plug and play system makes installation easy by any tradesperson and offers a stylish alternative to other disabled access products on the market. Häfele believe in making access for all about both style and functionality, allowing your customers to tailor their home to their needs without compromising on design or quality. 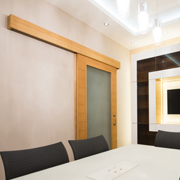 Slido 80m - These unique sliding door fittings allow wall mounted doors to glide faultlessly across openings, giving them the illusion of floating. A high-end choice, without the luxury price tag, this system is ideal for opening up partition walls in the home. The Junior 80 is light, quiet and corrosion resistant, making it perfect for cavity applications. This is one of our best value for money products, offering tried and tested application trusted in homes across the UK. 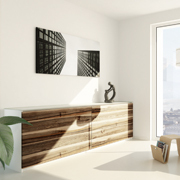 Whether you’re looking for sliding cabinet door tracks, cabinet drawer hardware or simply kitchen cabinet sliding door inspiration, Häfele has products to suit your every need. Kitchen design is becoming increasingly minimal, with only show-stopping appliance brands on display - like Smeg or Rangemaster - reiterating the importance of hiding clever storage solutions in order not to disrupt the chosen aesthetic. Hawa Concepta - The pivot sliding door system is ideal for open living spaces where creating a seamless and minimal finish is important. The Hawa concept is simple to install, being split into modular systems with no need for further drilling, making it not only great value for money, but costing you less time to fit. The range spans a variety of door weights and thicknesses; making it your go-to sliding kitchen system. 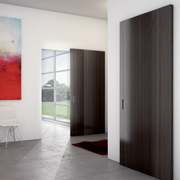 Eku Fro ntino 20 - The Eco Frontino 20 is a Häfele exclusive brand of premium sliding door gear for cabinet doors. You can rest assured that this product was created with ease of installation in mind, arriving as a pre-assembled fitting set and track, and an online planning tool easily available. View our complete range of furniture sliding door gear. Pocket doors are the perfect solution when you are creating an open plan space or where space is limited. 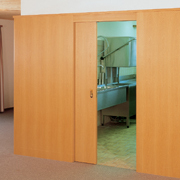 Where a standard door typically requires over 7ft of unobstructed space to open and close, pocket doors do not have this requirement. Häfele stock a variety of sliding pocket door hardware for domestic applications, including solutions designed specifically for the ‘Assisted Living’ category. The Slido Classic 160-B is a high quality pocket door system allowing doors up to 55mm thick to be fitted in a wall of 100mm. We know how important it is to have flexible product options, so this can be cut to suit standard UK door sizes, and ever larger custom doors. View our complete range of pocket sliding door gear. Although there may not always be beautiful blue skies, we Brit’s are always up for a picnic, a BBQ or even a casual beer in the garden with some friends. Patio sliding folding doors are the perfect way to open up the home into the garden, making it easier to entertain, watch the children play and enjoy the nice weather. Sliding folding patio doors also create a light, airy indoor space, allowing natural light to flood in and fill the home. This high quality folding door system is ideal for external doors to your patio and comes with added security features to keep your residential or commercial space secure. Now offered with a non-mortice option for easier preparation, the Slido Fold 100-U is one of our most popular, hardwearing and reliable sliding door options. View our range of patio sliding door gear or the complete sliding door gear range here.